A biopic about the late Queen frontman Freddie Mercury has been in the works for years now, though the originally cast star Sacha Baron Cohen and director Tom Hooper left the project in 2013, after six years of work. 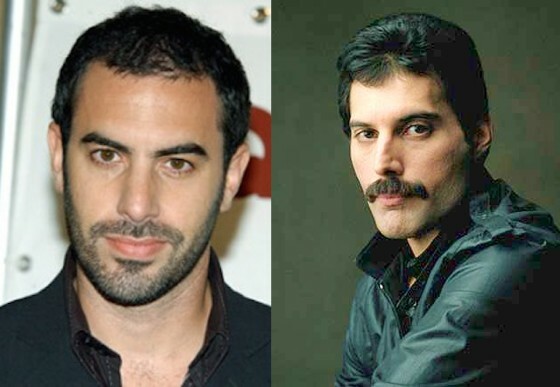 Baron Cohen cited "creative differences," claiming that the surviving band members wanted to portray a PG-rated version of the group's history, while he wished to depict a grittier, tell-all tale centred on Mercury. Queen commented on the actor's departure, saying they didn't want the film to turn into "a joke." Now, in a new interview with Howard Stern, Baron Cohen has expanded upon his involvement with the biopic and explained his decision to abandon it. He claims that a band member (whom he won't name) wanted the second half of the film to show "how the band carries on from strength to strength." That clashed with the slightly more R-rated side to Mercury that Baron Cohen wanted to capture. "The guy was wild," he said, speaking to Stern. "He was living an extreme lifestyle. Debauchery. There are stories of little people with plates of cocaine on their heads walking around parties!" He explains that he tried to dissuade the film from following the band after Mercury's death, saying: "Listen, not one person is going to see a movie where the lead character dies from AIDS and then you see the band carry on." Ultimately, though, Baron Cohen was unable to come to a compromise he felt comfortable being a part of and left, dubbing Brian May "not a great movie producer." "I understand it, they are a band. They want to protect their legacy as a band." To do so, the film's producers have most recently tapped Ben Wishaw to take on the role of the iconic Queen frontman. Listen to Stern's interview with Baron Cohen in the player below.